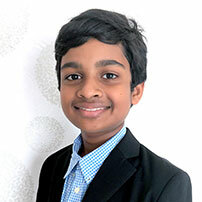 Advaith is a thirteen year old boy living in Singapore with his mother, father and sister. He published his first book, The Neighbourliens at the age of twelve. Advaith donates all his earnings from book sales to the underprivileged and needy. Currently he is writing the second book in The Neighbourliens series and a realistic fiction book. was in the panel of illustrators in The Kidz Parade Edutainment Magazine from 2013 to 2015.